Don’t miss Family Fun Night in Tutt Field House! Come out and cheer on the Kodiaks who host the Bulldogs from Calhan for an exciting Black Forest League matchup. 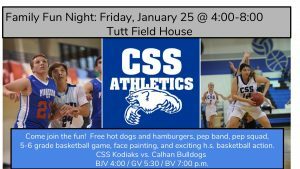 The CSS Booster Club will provide “free” hot dogs and hamburgers off the grill to the first 150 fans; the lively CSS Pep Band will share their tunes; the spirited Pep Squad will cheer on the Kodiaks; US art students will paint faces; and the 5/6 grade boys’ basketball team will be showcased between the varsity games. Wear your Kodiak blue and bring the family out for Family Fun Night!